This statistic shows the distribution of the outdoor activity participant population in the United States in 2014, by outdoor profile. 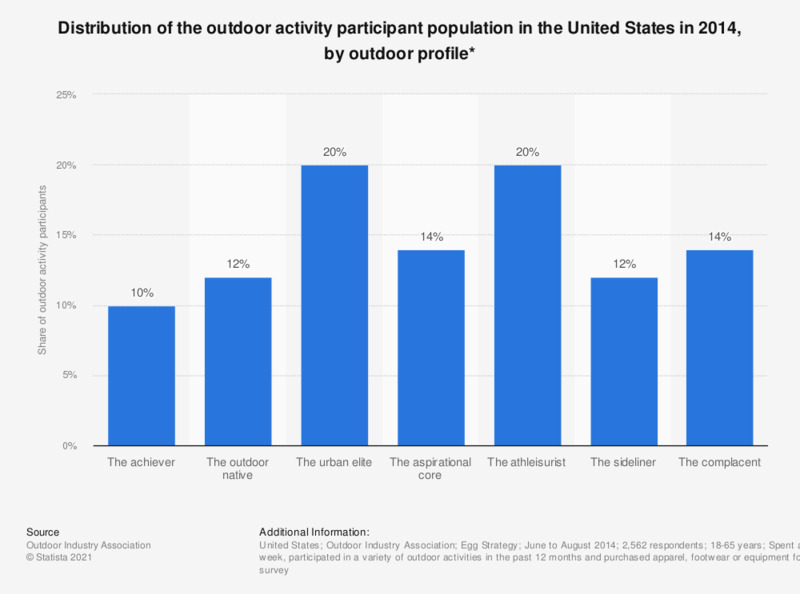 The urban elite accounted for 20 percent of the outdoor activity participant population in 2014. The achiever: traditional outdoor consumer motivated by performance and competition. Participate in all activities. The outdoor native: being outdoors is an important lifestyle choice, motivated by enjoyment and experience. Participate in leisurely activities, particularly with their family. The urban athlete: favorite activities require them to go outdoors. Participate in sports and team sports. The aspirational core: aspires to be outdoors but experience barriers. Participate in one or two activities. The athleisurist: content with current level of outdoor engagment, motivated by enjoyment and escape. Participate in relaxing activities such as gardening. The sideliner: enjoys the outdoors for sunshine and fresh air. Used to be more active but limited by injury or weight issues. The complacent: prefer to be indoors and stick to low-intensity activities when venturing outdoors.